In Japan, souvenirs were born to be eaten. And in Kyoto the choice of edible souvenirs is staggering. There's creamy green tea pudding, sesame flavored cookies, and innumerable pickles and dried fish, but nothing really screams "I've been to Kyoto" quite like yatsuhashi or nama yatsuhashi. 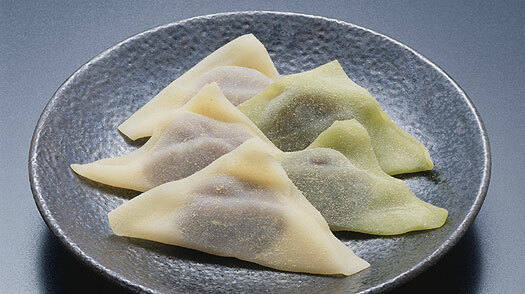 The former, a cinnamon-flavored cookie made from glutinous rice flour, is hard enough to break teeth, but the latter, a floppy unbaked version typically flavored with cinnamon, green tea or sesame (and often wrapped around sweet red bean paste), is just about the perfect match for a cup of green tea. You can pick up both varieties at the numerous souvenir shops in Kyoto Station and at major tourist attractions, but if you are in Gion, go straight to the source and visit Izutsu Yatsuhashi Honkan, a yatsuhashi maker that's been in business since 1805.